A new discovery runs counter to most observations about black holes, which are massive areas of space with extraordinarily strong gravity that can pull in anything — even light. In most cases, black holes and their host galaxies expand at the same rate. But astronomers have spotted a super-sized black hole in the early universe that grew much faster than its host galaxy. "Our survey was designed to observe the average objects, not the exotic ones," said C. Megan Urry, Yale's Israel Munson Professor of Astrophysics and co-author of a study about the phenomenon in the journal Science. "This project specifically targeted moderate black holes that inhabit typical galaxies today. It was quite a shock to see such a ginormous black hole in such a deep field." However, it was the mass of the surrounding galaxy that most surprised the research team. "The measurements correspond to the mass of a typical galaxy," said lead author Benny Trakhtenbrot, a researcher at ETH Zurich's Institute for Astronomy. "We therefore have a gigantic black hole within a normal-size galaxy." Stars were still forming in CID-947, the researchers said, and the galaxy could continue to grow. They said CID-947 could be a precursor of the most extreme, massive systems observed in today's local universe, such as the galaxy NGC 1277 in the Perseus constellation, 220 million light years from the Milky Way. But if so, they said, the growth of the black hole still greatly anticipated the growth of the surrounding galaxy, contrary to what astronomers thought previously. Urry and her colleagues credited the W.M. Keck Observatory in Hawaii and the Chandra COSMOS legacy survey in aiding the team's work. "The sensitivity and versatility of Keck's new infrared spectrometer, MOSFIRE, was critical to this discovery," Urry said. 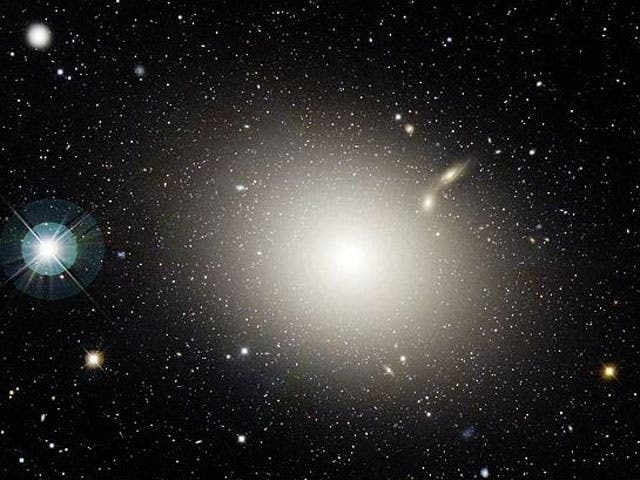 The black hole at the center of the super giant elliptical galaxy M87 shoen at the top of the page in cluster Virgo fifty million light-years away, is the most massive black hole for which a precise mass has been measured -6.6 billion solar masses. Orbiting the galaxy is an abnormally large population of about 12,000 globular clusters, compared to 150-200 globular clusters orbiting the Milky Way. Image credit: NASA/Canada-France-Hawaii Telescope, J.-C. Cuillandre (CFHT).